I do not know about you but I personally have had wild dreams of the gadgets I could have on my wrists, ranging from highly practical to downright ridiculous. Today we get a taste of something from the latter, a drone you can WEAR! About nine months ago, Intel started its “Make It Wearable” competition where the company encouraged people to the boundaries of technology to innovate and create something awesome. Intel will provide the winner of the competition half a million dollars along with mentoring. The winners need not invest the prize money in the project and could choose to keep it for themselves. A product of this competition is the Nixie, one of the top 10 selections. The Nixie is a wearable on a class of its own, it does not tell the time or count your steps, it bloody transforms into a flying drone and captures images and video! Details about the device such as how long can it stay airborne or how many pictures can it capture are not available but we know the Nixie is functional. The Nixie is made of a flexible material which straightens to form a quadcopter. After doing its round of recording, the Nixie will return to its owner seemingly by tracking the owner’s smartphone. 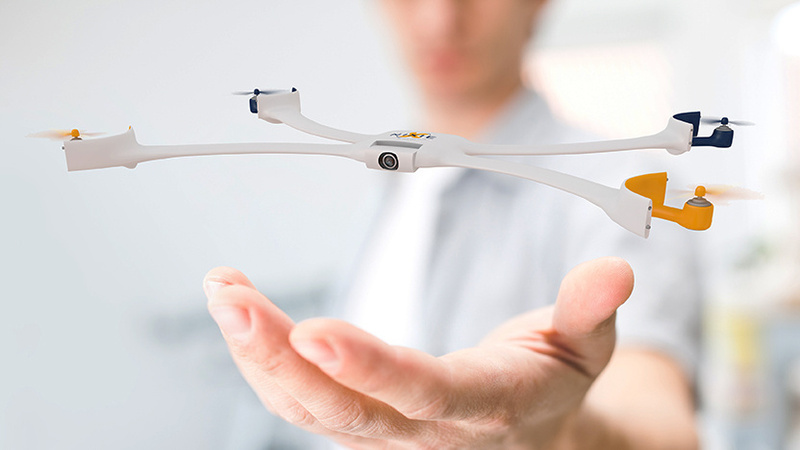 The drone was initially penned as a pair of glasses but the team eventually ended up designing based on the wristband form factor. The Nixie is still an early prototype and there is no guarantee on whether or not it will ever reach consumers. Laws regarding drones are very shady and recently lawmakers are pushing to limit how they can be used in public spaces. Regardless of the restrictions, the Nixie is proof that there are many markets yet to be tapped and innovators are all around to think outside the comfort zone and produce fantastical devices.